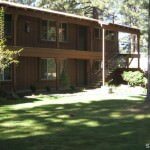 3610 Spruce Ave #6 South Lake Tahoe CA offered at $167,000Nicely remodeled 2 bedroom 1 bath condo is a must see! Special first floor end unit with no stairs. Kitchen has brand new cabinets and counter tops. The bath has a tile shower with a raised vanity with matching mirror and lighting. New flooring throughout. Living room, hall,and bedrooms have laminate and bathroom, tile flooring. Bedrooms have plenty of storage with mirrored closet doors. Double pane vinyl windows,and hot water...Continue Reading!